Yes it’s Wednesday and I’ve finally gotten around to doing another What is it Wednesday. I haven’t done this in a blue moon! Benzo actually requested that I do a WIIW on brown rice syrup because he wants to learn more about it. I first read about brown rice syrup in The Kind Diet . Not long thereafter I bought some to use at home. But what exactly is it? Brown rice syrup. What is it? Brown rice syrup is a liquid sweetener made from brown rice. It has the consistency of honey and is a dark brown. According to Wikipedia, brown rice syrup is made by cooking brown rice starch or flour with enzymes in order to break down the starches and covert them to sugar. The liquid is strained and reduced until it reaches the desired consistency. Brown rice syrup is made up of both simple and complex carbohydrates. It’s the complex carbs that make brown rice syrup seem “healthier”, and the fact that it is made from a whole grain. The complex carbohydrates are digested by the body more slowly than the simple carbohydrates, giving BRS a lower overall GI score. In this way, brown rice syrup appears superior to sugar in that it smooths out blood sugar levels better than sugar does. However please take note that brown rice syrup is still a sugar and should not be consumed in excess. If you have issues with blood sugar please consult your doctor about brown rice syrup. I bought a jar of the Lundberg brand at Whole Foods for $4-5. You can find brown rice syrup in the health foods section of a regular grocery store, probably near the honey or sugar. At Whole Foods it is with the baking supplies, near the honey and agave syrup. 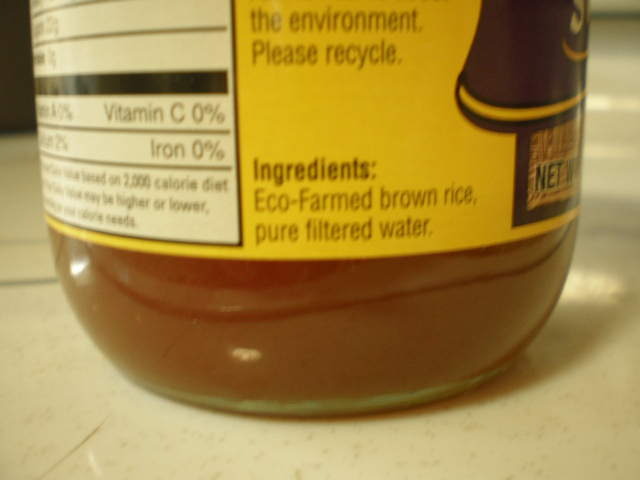 The only ingredients are “eco-farmed brown rice, pure filtered water.” I’m fairly sure that “eco-farmed” is not a regulated term so don’t read too much into that. Lundberg also makes an organic version but for some reason I did not opt for that one when I bought this jar. Brown rice syrup can be used to sweeten coffee or tea just by stirring as much as you want into your cup. It could also be used to sweeten marinades and sauces. In cooking, brown rice syrup can by substituted 1:1 for other liquid sweeteners like honey or maple syrup. But bear in mind that brown rice syrup is less sweet than other sweeteners, so the end result will be less sweet as well if using a 1:1 substitution. If you want the same level of sweetness use more brown rice syrup and reduce some other liquid in the recipe. Brown rice syrup can be substituted for granulated sugar in baking as well. However because brown rice syrup is a liquid and sugar is not, some other liquid in the recipe will need to be reduced. 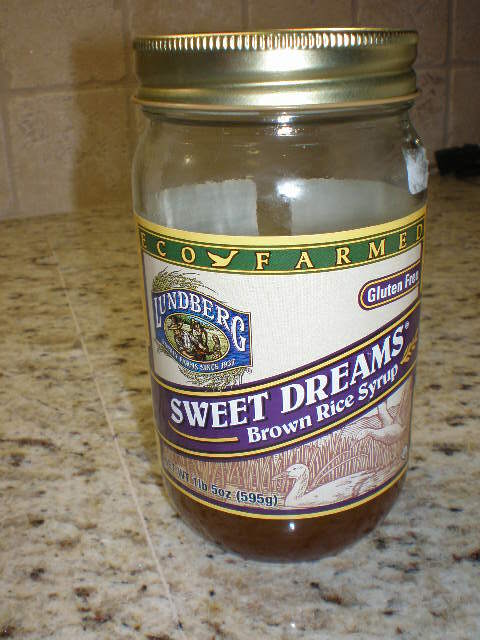 The side of the Lundberg jar tells gives instructions on how to swap brown rice syrup for sugar. I also like to refer to Happy Herbivore’s substitution guide on sugar on her FAQ page. She says to replace 1 cup of sugar with 3/4 cup brown rice syrup and also reduce other liquids by 1/3. I have used brown rice syrup to make cornbread and zucchini bread. The cornbread turned out good and I couldn’t really taste the difference. The zucchini bread was somewhat of a fail, but I don’t know if it was because of the brown rice syrup or not. It tasted good, but wasn’t done all the way through and didn’t really rise like a quick bread should. So it could’ve been another problem that had nothing to do with the brown rice syrup. I plan to experiment more with brown rice syrup and I also want to try some recipes that are already BRS-ready so I don’t have to worry about the conversions. One more thing to note is that brown rice syrup can contain gluten, so if you are watching gluten in your diet be sure to get a gluten-free variety. So what do you think? Does brown rice syrup peak your interest? 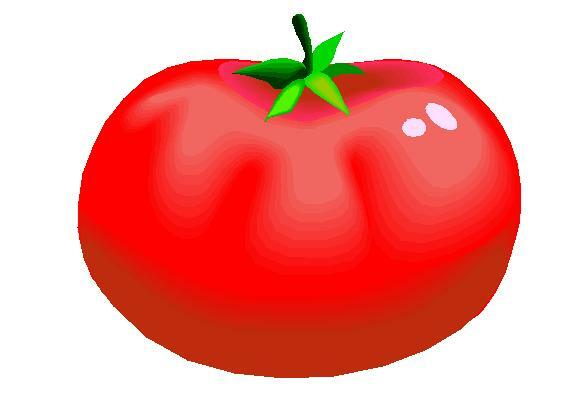 Have you ever used it in cooking or baking before? With success or not? Looks are deceiving. The jar may be clean on the outside but the top is really sticky. So much that I have a really hard time getting the lid open and usually have to enlist Benzo’s help. I think I really need to buy VCIYCJ! I use brown rice syrup instead of maple syrup on waffles! I also use brown rice syrup in place of ‘corn syrup’ (like Caro syrup) when making candy. For example I used it to make peanut brittle, and it always came out perfect. I buy the organic kind, at the health food store. Check out the news on arsenic in rice…brown more than white.